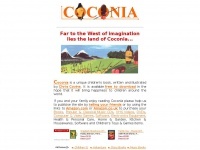 'Coconia' by Chris Covins is an illustrated children's book that is FREE to download - so that everyone can enjoy its magic. The web server used by Coconia.co.uk is located in Great Britain and run by Easyspace Virtual Servers. This web server runs a few other websites, mostly in the english language. The websites of Coconia.co.uk are served by a Nginx server. Both the inclusion of the website in search engines and follwoing of its hyperlinks is explicitly allowed.